Automotive journalists have named the aluminum-body 2015 Ford F-150 their North American Truck/Utility of the Year, and the Volkswagen Golf took first among cars. The awards were announced Monday at the North American International Auto Show. Here are the first and second votes. The new F-150 weighs 700 pounds less thanks to its shift to an aluminum body. As a result, the collision repair industry is scrambling to prepare in terms of expensive training and equipment to work on what has been in the past a highly popular model. 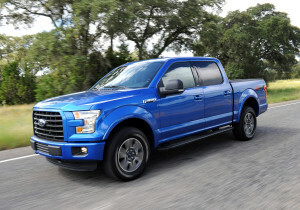 The F-150, with 297 points, beat out the Chevrolet Colorado (205) and Ford the Motor Company’s Lincoln MKC (68) to win. It was a larger margin than the Golf, which with 265 points beat the Ford Mustang (204) and Hyundai Genesis (110).